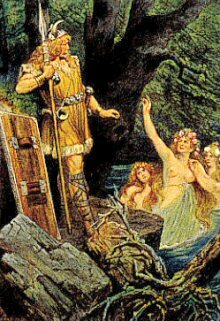 in Germanic saga and history. 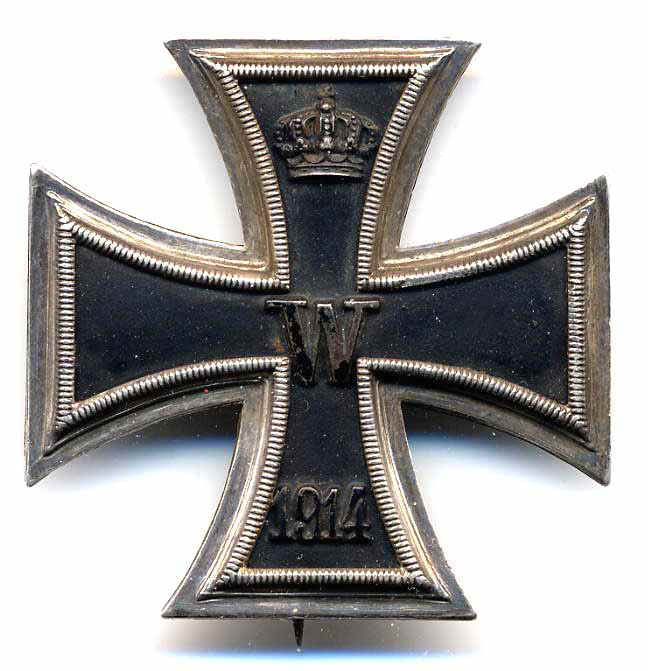 DESCRIPTION: This is an elegant piece of German WWI-era jewelry, completely original and definitely period; it’s just as nice a piece of jewelry as we have ever seen in German museum collections. The pin that holds the roundel is also in 10K gold. 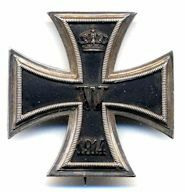 The motif is the Iron Cross in elegant fine enamel and the crown “W” and the date “1914” are in brilliant, fine detail. All around this is a branch of laurel leaves on the right and oak leaves on the left and seen on the back is a “10K” stamp. 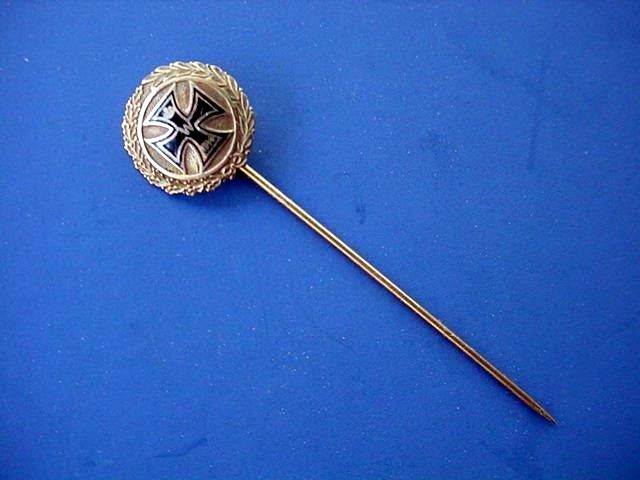 In our estimation this is a stickpin meant for a person of noble bearing or landed gentry; anyone but the common-man’s bauble. 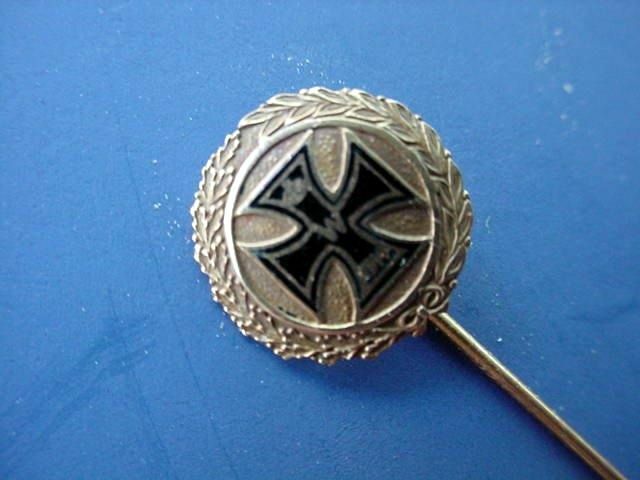 If you are an Iron Cross enthusiast this one is for you, but also if your collection embraces the elegant and precious, you will surely treasure this one. PRICE: $500.00; you may never see another! 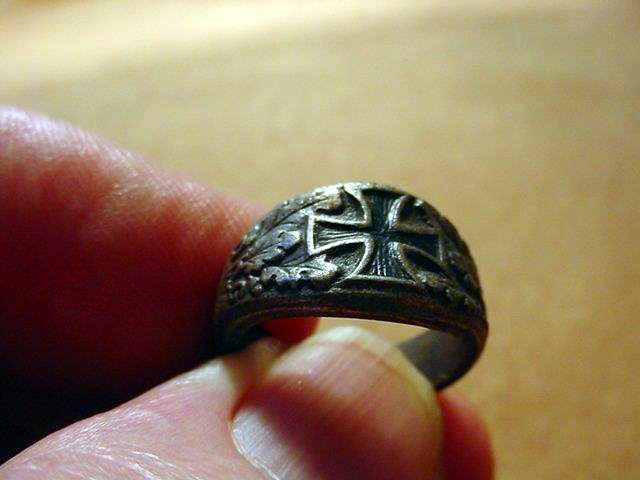 DESCRIPTION: This is very petite ring probably worn by a woman. 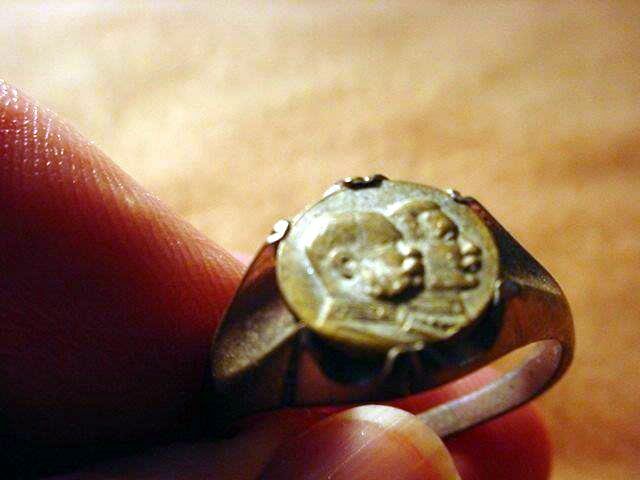 It is a patriotic ring worn by persons who supported the monarchies. 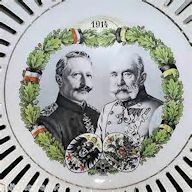 It’s in a 9 ½ size and the figures of the Kaisers are so small as to need magnification to see, but nonetheless, it is a rare, esoteric item for the true collector. 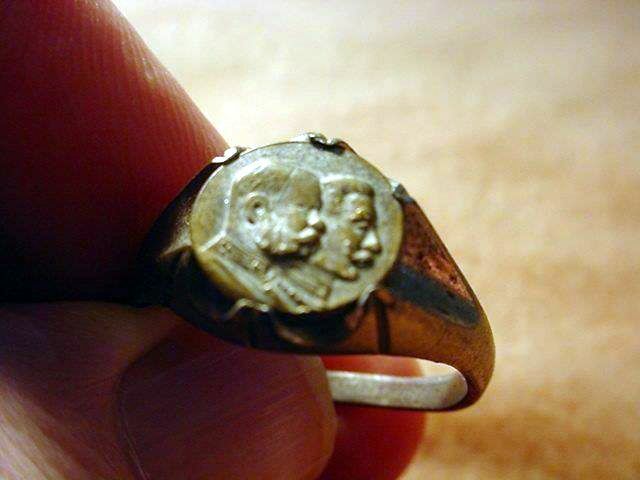 DESCRIPTION: This ring would be given to persons who were patriotic enough to give funds to support the German Kaiser and Reich with generous donations and sometimes even their sons. This was early in the war because, later, people were asked to donate silver and gold for support for the war efforts. 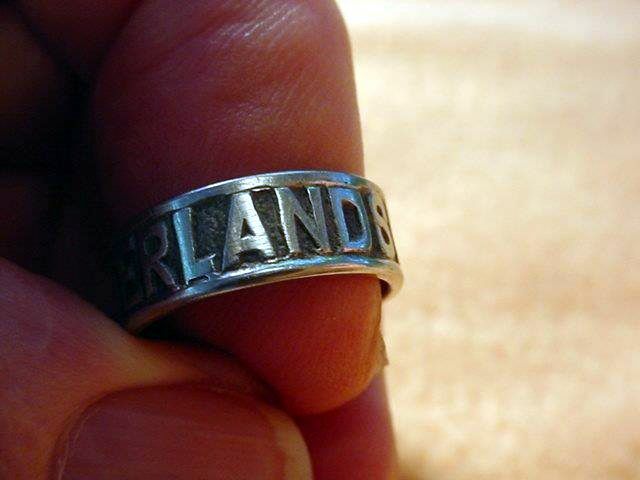 The ring has the words that surround it saying “Vaterlands Dank (Fatherland, Thanks). 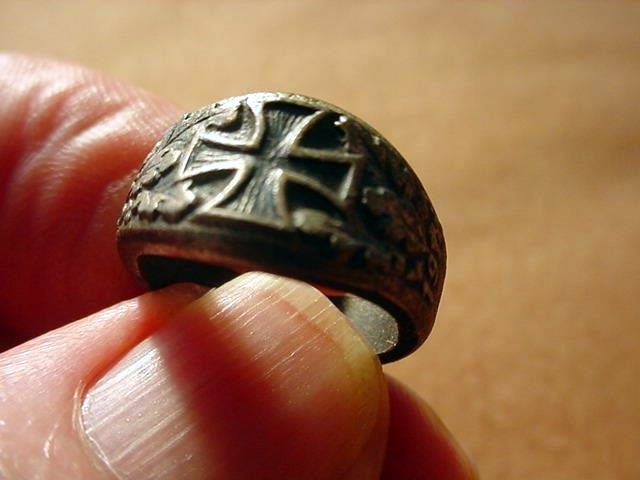 It is a very small size 6½ and in very good condition. 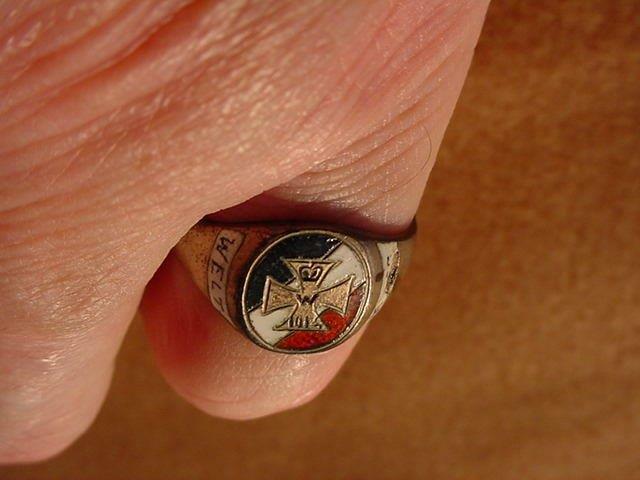 DESCRIPTION: Here is a rare finger ring that has the German Wound Badge with crossed swords as its central theme. 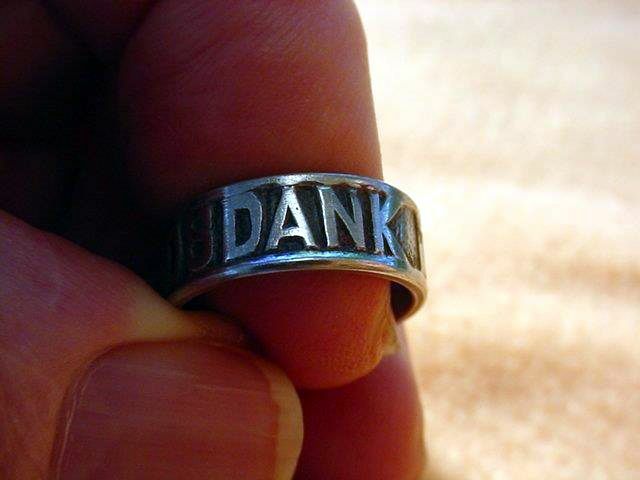 It has “800” for silver content stamped deeply inside the shank. We have only one of these and it’s a size 8. It’s petite, but neat! 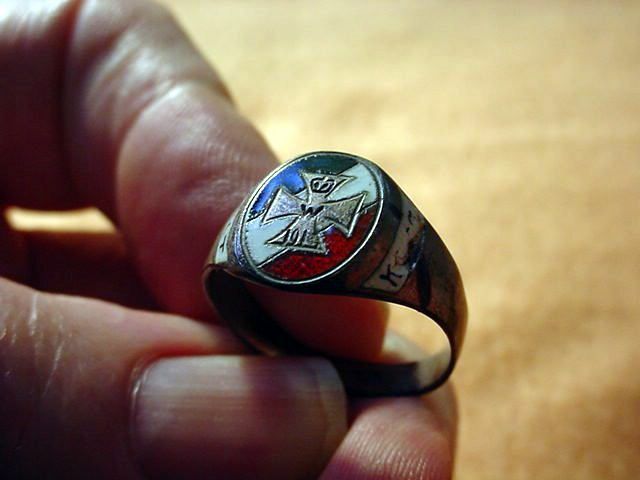 DESCRIPTION: Here is a really nice WWI patriotic ring with a beautiful, little Iron Cross that is seen with the black, white, and red German national colors behind it. Flanking the sides were the words Weltkrieg (World War), but the side where “Krieg” would be has been broken, but it is still presentable and historically important and nice. It’s stamped “800” inside. 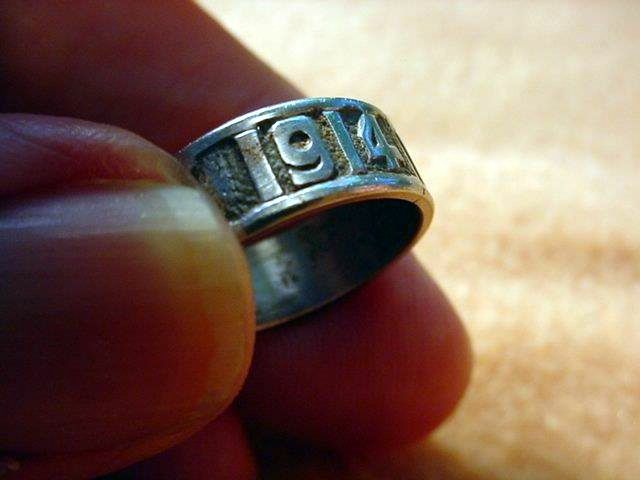 DESCRIPTION: Here is possibly one of the most different patriotic rings that I have ever seen. 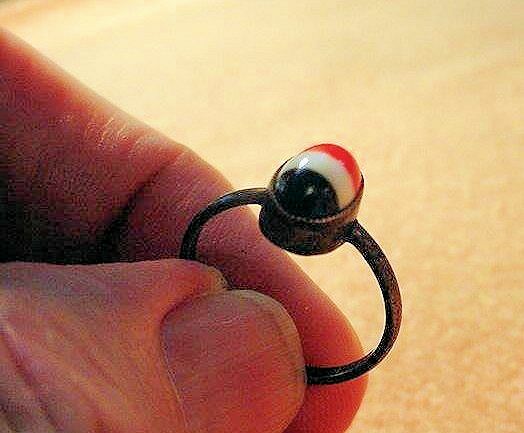 It has a beautiful egg-shaped enamel stone mounted in a silver setting. 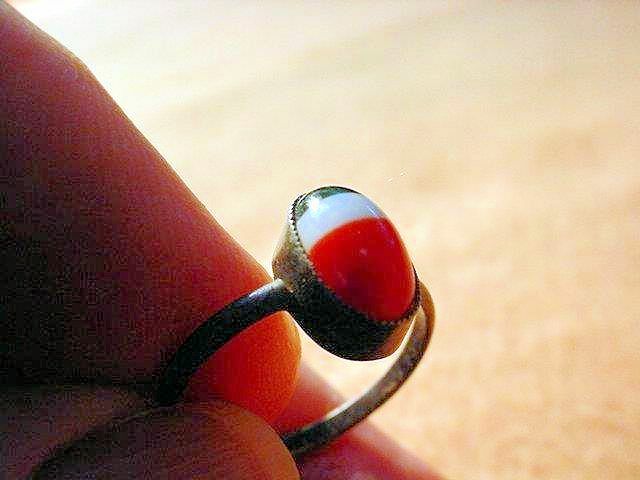 The stone is colored with the German National Farbe—black, white, and red. It is extremely petite with a really dainty shank. It is in size 6½. We have only the one and it is quite rare. 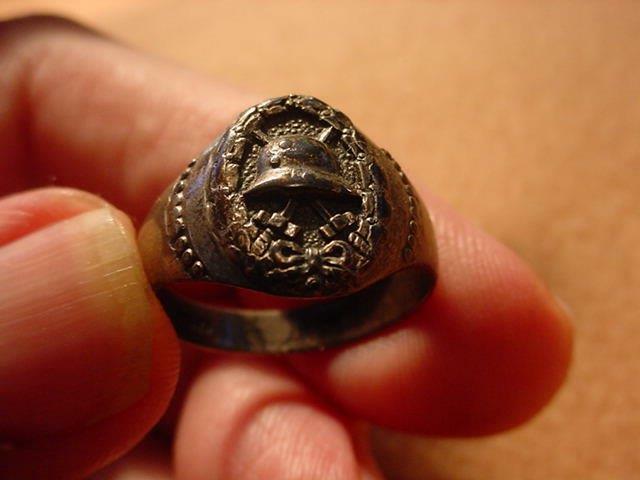 DESCRIPTION: For an explanation of the tradition behind this ring, go to Item WWI 6-12. 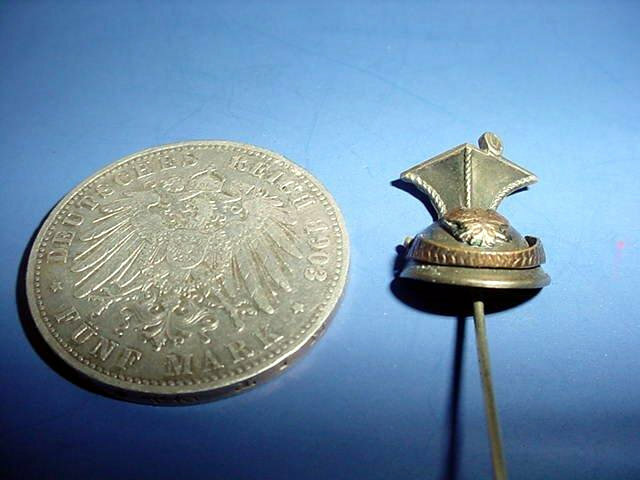 This one we offer here is much smaller than the ones pictured there and sold, and is probably the smallest ring we have ever offered (size 4); probably for a small Fräulein. 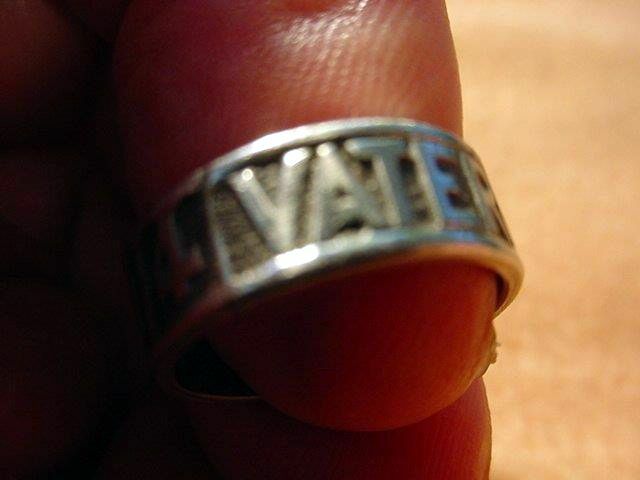 You have to use magnification to see the patriotic message, but it’s there–rather worn, but readable, at least. DESCRIPTION: This, without any attempt at circumlocution, is one of the finest pieces of Imperial patriotic jewelry we have ever seen. It is petite, but handsome. 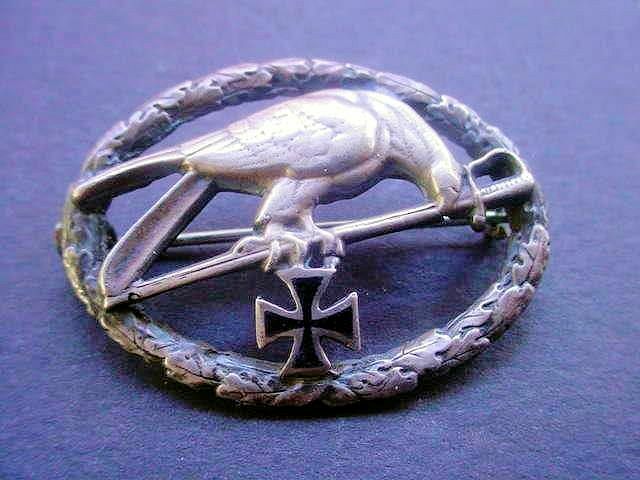 It measures about 1 1/2 inches long and depicts the German eagle holding a sword from which an Iron Cross Medal is suspended. All around the beautiful wreath that this theme is contained in are oak leaves. 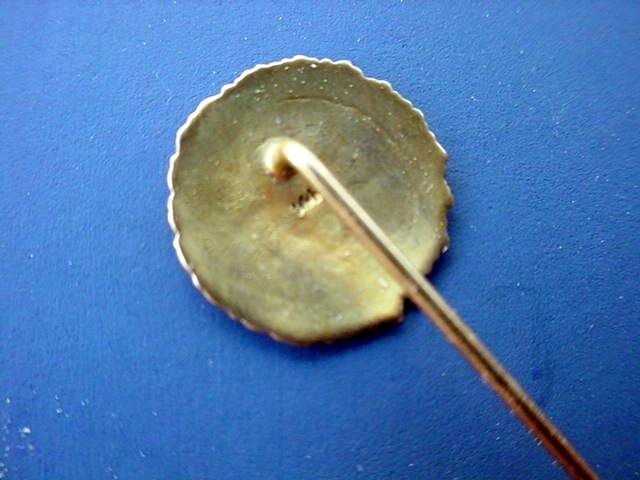 The pin is struck in pure “800” silver, but not stamped as such. 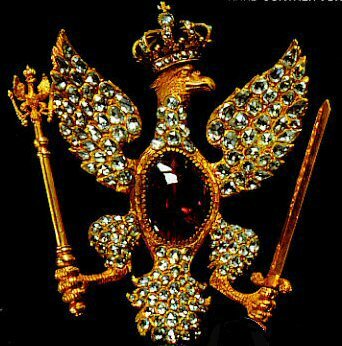 It’s beautiful and elegant and very Prussian. 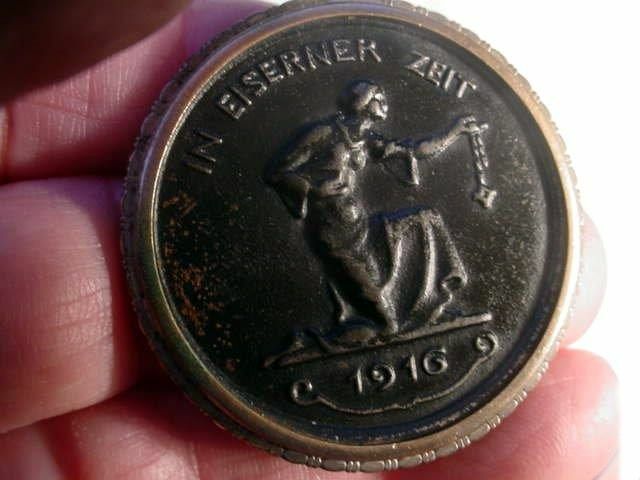 DESCRIPTION: This medallion made of iron that has a silver and gold-colored bezel around was part of an expansive program in which patriotic German women would hand in their precious gold jewelry during the war years 1914-1918. This was to aid the war effort for the besieged Fatherland. 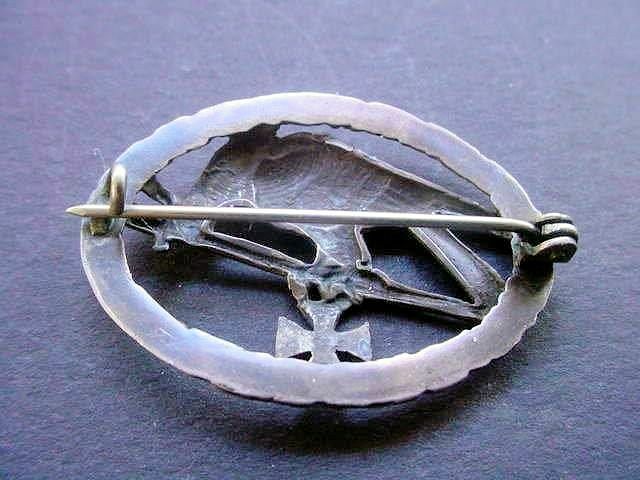 Mothers, sisters, wives, and girlfriends wore these iron pendants after donating their wonderful items of jewelry to the Prussian government. The beautiful gold jewelry was sold to finance Germany’s struggle. 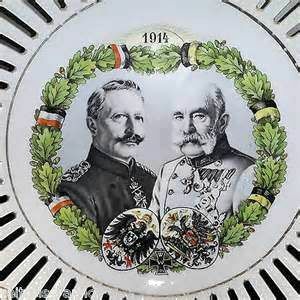 This tradition began in the early years of the 19th century when German citizens were called upon to exchange their gold and silver jewelry for Gothic-looking pieces of ornamental iron jewelry. The funds raised were designated to be used to finance Prussia’s part in the Napoleonic wars, which raged across Europe and beyond from 1803-1815. The patriotic replacements were called “Berlin Iron.” Rings, pendants, bracelets even frying pans made of copper were donated. 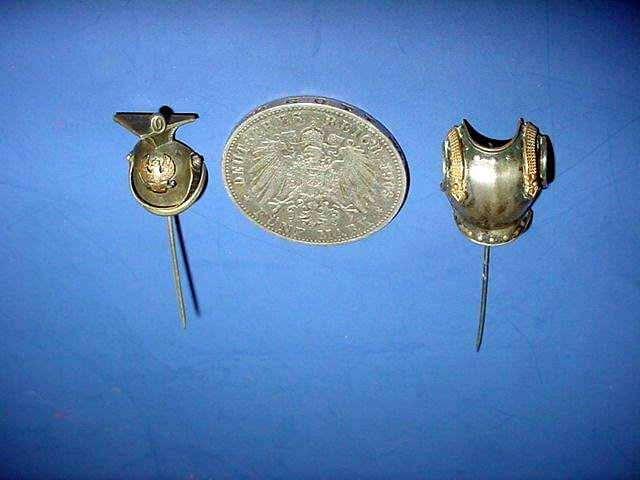 As Germany tried to meet the colossal costs of WWI, citizens were very proud to wear these patriotic implements and baubles. 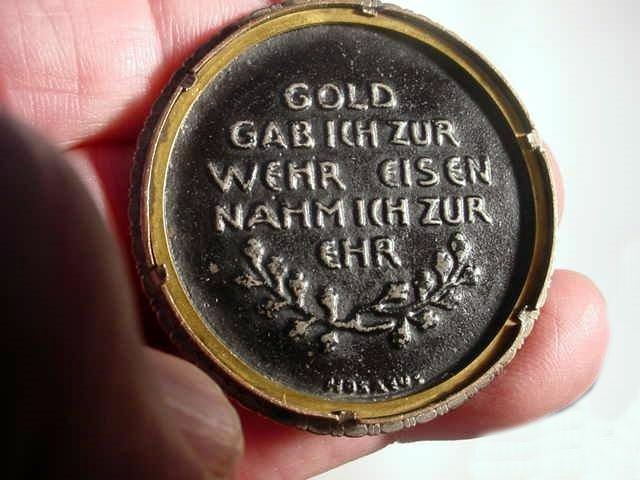 The ring replacements would invariably say inside (Gold gab ich für eisen 1914) or other of the war years, translated this means “I gave gold for iron.” The medallion we offer says “IN EISERNER ZEIT 1916” “In the iron time 1916.” On the back it says: “GOLD GAB ICH ZUR WEHR EISEN NAHM ICH ZUR EHR.” That means: “I gave gold for the defense; I took iron for the honor [of it].” The medallion measures about 1 3/4 inches (4.4 cm) in diameter and on its front is the depiction of a woman handling her golden medallion over in supreme patriotism. There is a jump ring at the top attached to the fine bezel. It is obvious that these iron medallions were not actually issued with the fine jeweler’s bezel, but the lady must have had it mounted and wore it with all the patriotic fervor that could be mustered in that Iron Time. 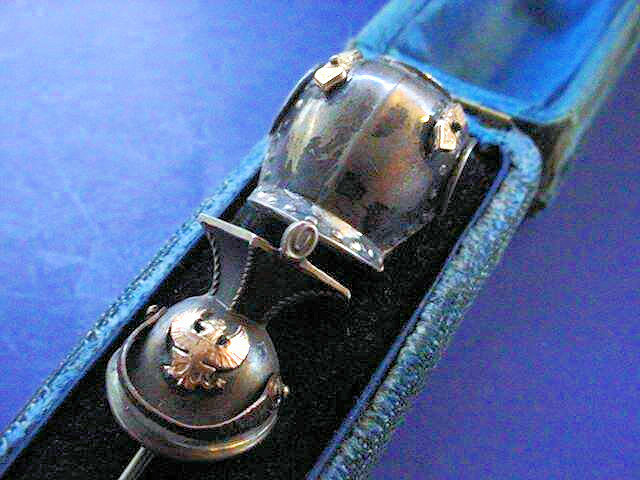 DESCRIPTION: Here is a set of fine jewelry of the Kaiser Reich period that is comprised of the uhlan cap called a Tschapka and the body armor is known as a cuirass. This was the battle dress of the lst Guards Uhlans that was first established as a Garde Landwehr Kavallerie regiment. It was a light cavalry regiment of Uhlans of the Royal Prussian Army. 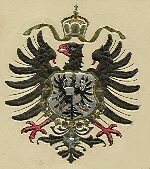 The regiment was later reorganized as heavy cavalry Uhlans and renamed into 1st Garde Uhlan Regiment in 1826. 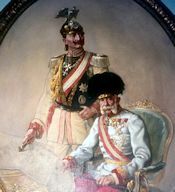 It fought in the Austro-Prussian and Franco-Prussian wars. In World War One the regiment was part of the famed Guards Cavalry Division fighting on the Western Front. 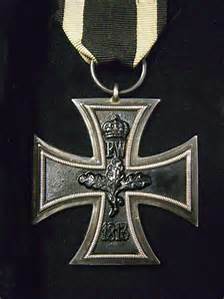 In peacetime it was stationed in Berlin and was part of the elite Royal Garde Korps. 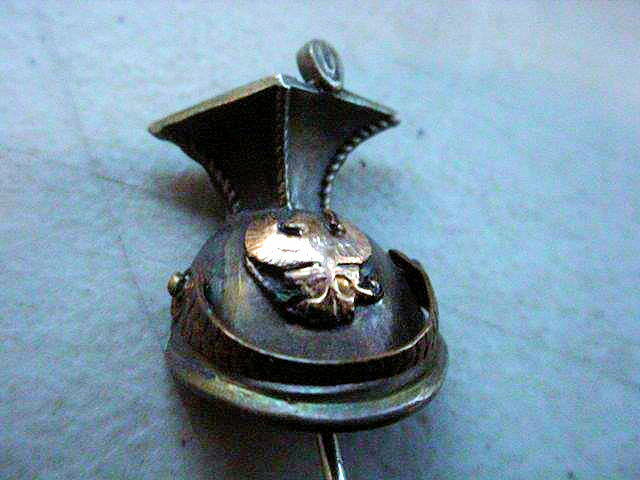 Its members wore a very gorgeous and resplendent uniform, but in combat they wore the necessary metal chest cover known as a cuirass that covered the gorgeous tunic and protected the soldier. 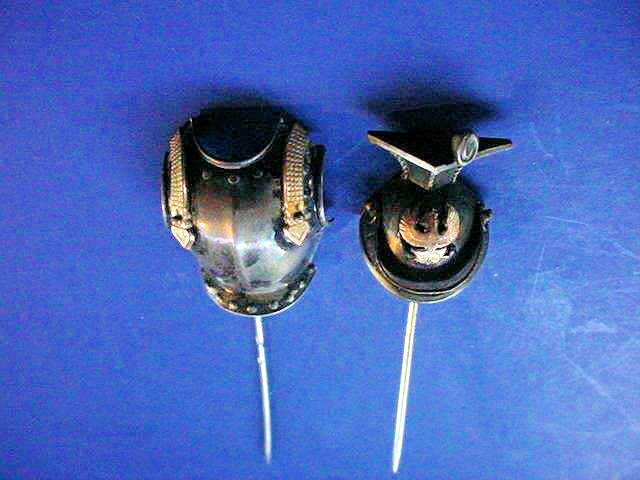 The two stickpins are in the original case that they came in and it is intact, but shows much outer wear after about 150 years or so of handling; the pins themselves are in excellent condition. The cuirass is absolutely historically correct and is in perfect detail. You can see plainly the many small brass links that would be laid over the straps (chainlike). 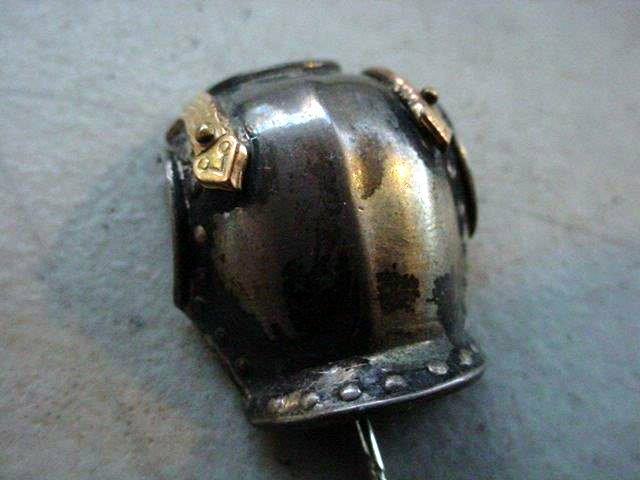 The links and straps appear to be in “gold.” The Tschapka, or helmet, has a Prussian Empire eagle also in gold plus the chinstrap is also crafted in the precious metal. 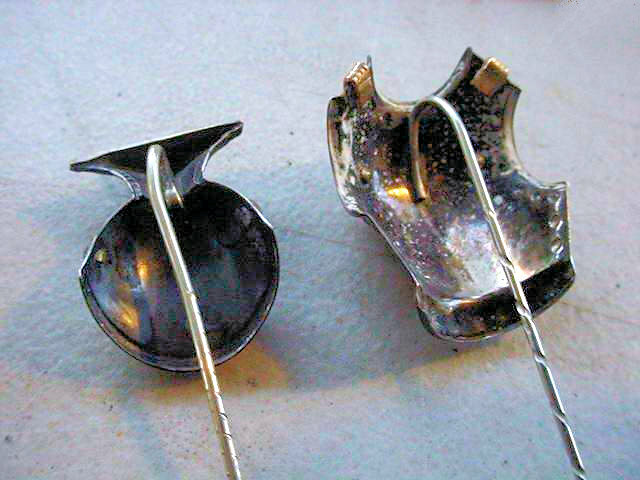 The other parts of both pieces are formed in fantastic detail in what appears to be “835” silver, but is not marked as such. We have left a familiar object near the pieces to give you an idea of the size of the pieces. That object is a 1903 German 5-mark piece. For stickpins they are quite large. 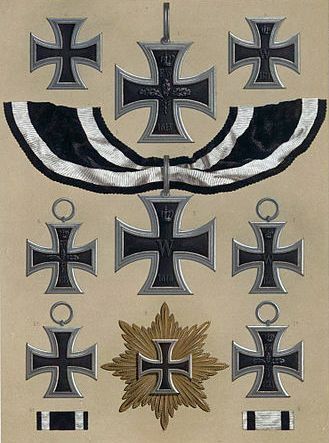 If we were to guess after many years in this field we would have to say that this beautiful assemblage was possibly presented to a retired officer of Uhlans in appreciation of his service to Kaiser and Fatherland. The case still snaps shut and the hinges are good. This very probably unique and certainly beautiful to you and me, but then neither of us is politically correct, right? We do not have this item. It's in the Pottsdam Museum.